M.A.S. #5 (Mighty Atom Smasher Compilation, 2006) - We Insist! We Insist! Mighty Atom Smasher compilations offer innovative schemes to generate real opportunities for the region’s artists and industry. 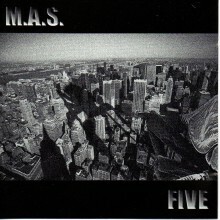 Formed in 2001 by Kevyn Gammond, M.A.S. Records is endorsed by the industry at the highest level, with patrons such as Robert Plant and Karl Hyde of Underworld. Included on the #5 edition was an earlier version of "An Architect" later re-recorded for the 2007 release "OH! Things Are So Corruptible".